ATLANTA–A molecule produced during fasting or calorie restriction has anti-aging effects on the vascular system, which could reduce the occurrence and severity of human diseases related to blood vessels, such as cardiovascular disease, according to a study led by Georgia State University. 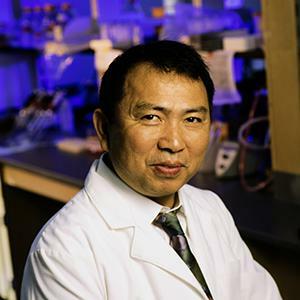 "As people become older, they are more susceptible to disease, like cancer, cardiovascular disease and Alzheimer's disease," said Dr. Ming-Hui Zou, senior author of the study, director of the Center for Molecular and Translational Medicine at Georgia State and a Georgia Research Alliance Eminent Scholar in Molecular Medicine. "Age is the most important so-called risk factor for human disease. How to actually delay aging is a major pathway to reducing the incident and severity of human disease. In this study, the research team explores the link between calorie restriction (eating less or fasting) and delaying aging, which is unknown and has been poorly studied. The findings are published in the journal Molecular Cell. The researchers identified an important, small molecule that is produced during fasting or calorie restriction conditions. The molecule, β-Hydroxybutyrate, is one type of a ketone body, or a water-soluble molecule that contains a ketone group and is produced by the liver from fatty acids during periods of low food intake, carbohydrate restrictive diets, starvation and prolonged intense exercise. "We found this compound, β-Hydroxybutyrate, can delay vascular aging," Zou said. "That's actually providing a chemical link between calorie restriction and fasting and the anti-aging effect. This compound can delay vascular aging through endothelial cells, which line the interior surface of blood vessels and lymphatic vessels. It can prevent one type of cell aging called senescence, or cellular aging." "We think this is a very important discovery, and we are working on finding a new chemical that can mimic the effect of this ketone body's function," Zou said. "We're trying to take the global approach to reducing cardiovascular disease and Alzheimer's disease. It's difficult to convince people not to eat for the next 24 hours to increase the concentration of this compound (β-Hydroxybutyrate), and not everybody can do that, but if we can find something that can mimic this effect and people can still eat, it would make life more enjoyable and help fight disease. Co-authors of the study include Young-min Han (lead author), Tatiana Bedarida, Ye Ding, Brian K. Somba, Qiulun Lu, Qilong Wang and Ping Song of Georgia State. The study is funded by the National Heart, Lung and Blood Institute of the National Institutes of Health. To read the study, visit https://www.cell.com/molecular-cell/fulltext/S1097-2765(18)30605-1.